The 2018 Mercedes-Benz Metris is the Sprinter Van’s smaller sibling. That doesn’t mean it lacks power and capability—quite the contrary. Equipped with one powerful engine and a series of handling features, the new Metris Van tows, hauls, and runs like a champ. Find out what makes the Metris performance specs and features so unique below! 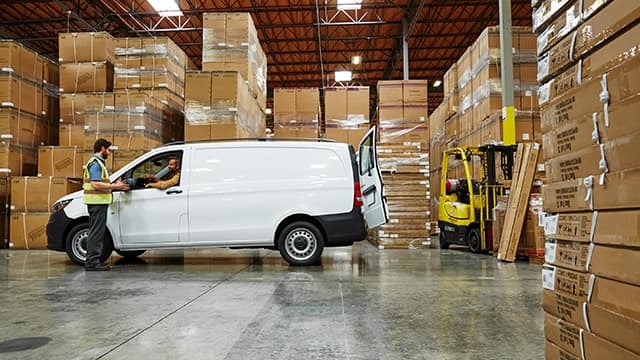 Metris WORKER Cargo Van—tows up to 5,000 pounds and has a max payload capacity of 2,502 pounds. Metris Cargo Van—tows up to 5,000 pounds and has a max payload capacity of 2,502 pounds. Metris WORKER Passenger Van—tows up to 5,000 pounds and has a max payload capacity of 1,874 pounds. Metris Passenger Van—tows up to 5,000 pounds and has a max payload capacity of 1,874 pounds. Crosswind Assist: At highway speeds, this feature uses targeted breaking to prevent strong, side-blowing winds from shifting the Metris Van off course. Load-Adaptive Electronic Stability Program (ESP®): If wheel-spin, understeer, or oversteer is detected, this system intervenes automatically by breaking individual wheels to correct the van’s course. Test Drive the Metris at Mercedes-Benz of Fairfield in Fairfield! Does the 2018 Mercedes-Benz Metris Van seem like the perfect fit for your Napa business? Schedule a test drive with the Metris Van to learn more about its specs and variety of performance features. Don’t forget to browse our Mercedes-Benz national van offers for specials on a brand-new work van. While you’re here, check out our guide to the Mercedes-Benz Metris interior. 0 comment(s) so far on What Are the 2018 Mercedes-Benz Metris Performance Specs?